If you have any question about the size, please email us! S: Bust:110cm; Length:69cm; Sleeve:56cm; Shoulder:47cm. M: Bust:114cm; Length:71cm; Sleeve:58cm; Shoulder:48cm. L: Bust:118cm; Length:74cm; Sleeve:60cm; Shoulder:50cm. XL: Bust:122cm; Length:76cm; Sleeve:61cm; Shoulder:52cm. 2XL: Bust:126cm; Length:78cm; Sleeve:62cm; Shoulder:54cm. 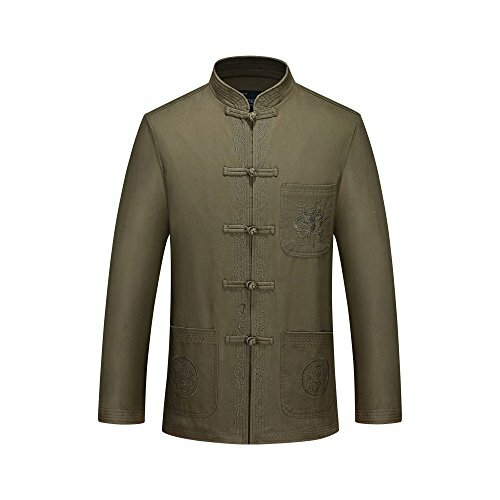 tang suit is generic term for Chinese clothes, as Chinese traditional clothes,has its unique charm, this item is suitable for your spring autumn life. ★HIGHEST-STANDARD WORKMANSHIP – With Chinese traditional workmanship and high quality Cotton, they’re great for sensitive skin. ★BREATHABLE – It is made of high-quality breathable Cotton which will prevent excessive perspiration and keeps body comfortable. ★COMFORTABLE – They are soft and elegant. In Tai Chi practicing, the uniform makes the practitioner feeling comfortable, meeting the requirements of Tai Chi practicing. ★NOT EASILY DEFORMED – With the stand-up collar, the uniform will not deformed after washing. ★PORTABLE, LIGHTWEIGHT AND CONVENIENT – Fits in any occasion, and it can be carried anywhere, anytime.